Here's the 112th Field Artillery, a New Jersey unit, in marching formation. Notice how close to the side of the road they are. 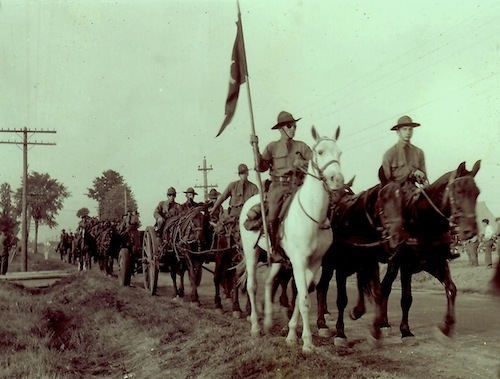 In 1935, similar artillery horses from Fort Myer in Virginia were marched 300 miles on hard-surfaced roads to test out horseshoe designs. 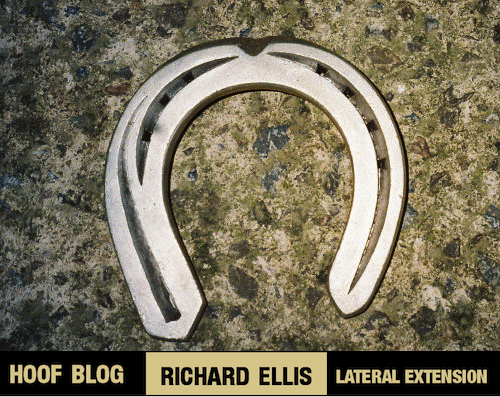 One clue led to another, and finally I tracked down an interesting account of how--and why--the US Army selected its horseshoes in the mid-1930s. Paved roads were everywhere by then, and they realized that, in the event of war, artillery would be transported over pavement, and the horses' feet would have to accommodate hard-surfaced roads of different types. People sometimes refer to the musical sound of horse hooves. Others remark on the music that the hammer makes on the anvil. Hit the right thing the right away, and you'll hear a tone that you can adjust by hitting it with something else, or by hitting the same thing in a different place. Is percussion by itself still music? Something caught my eye today in a news release from the always-helpful Equestrian New Zealand High Performance Media Liaison Officer, Diana Dobson. 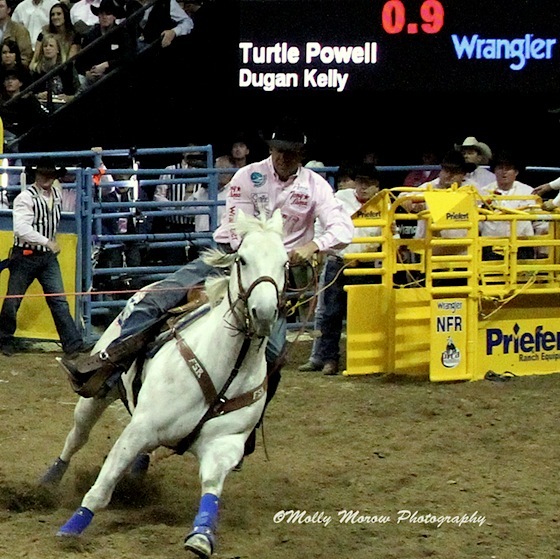 World Champion Team Roper Turtle Powell was back in the saddle of his favorite horse last week. And no one at the Wrangler National Finals Rodeo (NFR) even noticed. In the world of rodeo, bad news travels fast. When the ropers on the circuit heard that Turtle's outstanding horse "Vegas" had spent three months in vet hospitals in Montana and Washington because of fever and, eventually, severe laminitis, they shook their heads and said, "Too bad." They knew they'd never see the horse again. 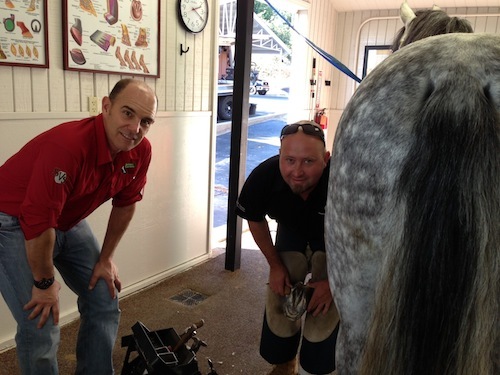 Lameness-specialist veterinarian Mark Silverman, left, and creative-thinking farrier Ernest Woodward, right, have opened the Southern California Equine Podiatry Center outside San Diego, California. 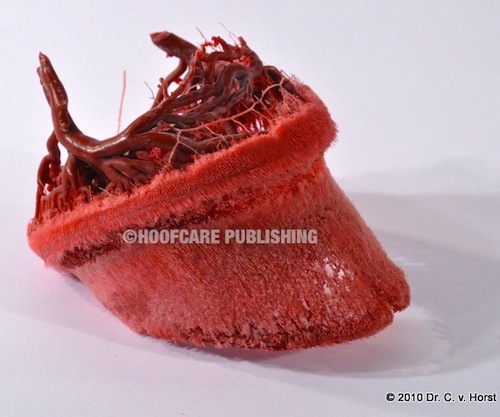 The Hoof Blog asked them to share this case, which is somewhat more practical and more economical than many hoof repair treatments. To accomplish it, you need to know and understand the products used and their properties in order to select the right fabric, adhesive and/or impression material to insure the success of the job. Friends at Work: Would You Put Yourself in His Shoes? Photographer Arjan Haverkamp saw nothing unusual about this scene at the Dierenpark Amersfoort (zoo) in The Netherlands. I think he was curious about the donkey's hooves. When I saw the photo, all I could see was the farrier's shoes! 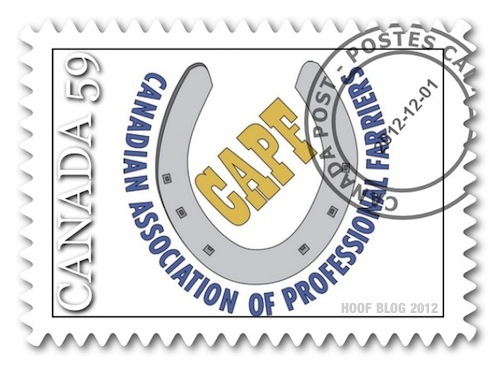 The Canadian Association of Professional Farriers (CAPF) has been launched as an affiliate of the American Association of Professional Farriers (AAPF) to provide Canadian farriers with a professional organization that not only promotes the integrity of the farrier industry as a whole, but also strengthens the knowledge and skill set of its membership. You have to love the sport of reining, but you also have to admit that it is all sort of a blur when those horses pick up the tempo. During the spin and slide I always wish I could see their legs and hooves. Good luck with that! An anatomy museum is a wonderful place. But who among us can travel to Harvard's Museum of Comparative Zoology or to London's Natural History Museum when we feel like studying anatomy? 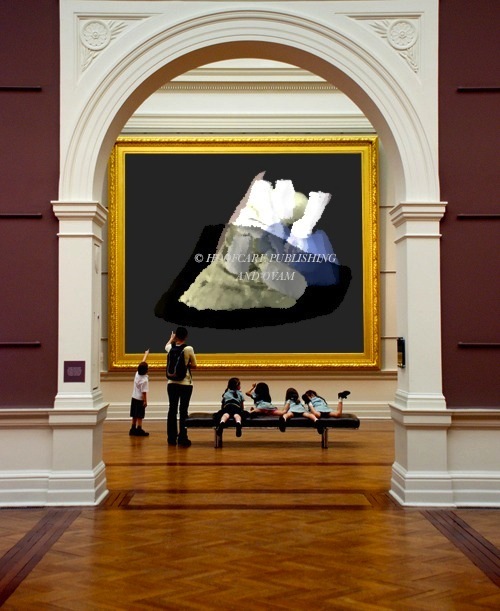 If we can't go to the museum, can the museum come to us? Guess what? It already has. 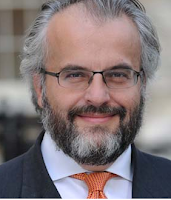 Meet Andrew Crook, head of the anatomy service of the Royal Veterinary College in Great Britain. He'll explain more about his job to you in this video, which is designed to introduce new students to the anatomy services of the college. Have you ever considered the variety of specialty professional positions within the broad category of "hoof-related"--meaning that they are available to someone who is interested in applying (or pursuing eternally) their knowledge of the horse's foot? Have you ever been to Ireland? Just click on the "play" icon and you can go there, for a half-hour or so, at least. But hang on tight--you're going to go back in time. The year was 1977, and Raidió Teilifís Éireann (RTE, the national broadcast service in Ireland) is interested in producing a radio documentary about farriers. It's a trade with one foot in the past and one in the future, and they select a representative group spread across the land from the city streets of Dublin to the wild western counties. It did make it on the air, but then it went into a vault, never to be heard again. Until, of course, the Internet and the Hoof Blog came along. RTE very kindly gave permission for the entire broadcast to be mounted on the blog. If you don't understand the very beginning, don't worry: it's in Gaelic! About halfway through, the crew is in Dublin, where they are entertained by the well-known farrier John Boyne, who died of a heart attack two years ago. 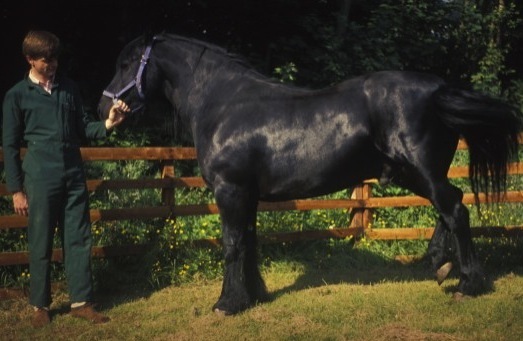 Boyne was the farrier at the Royal Dublin Show for many years, and shod the horses of the Irish showjumping team at the Army stables in Dublin. Americans might tip their hats to John; he was the farrier who trained Seamus Brady, longtime US Equestrian Team farrier, among many others. John Boyne shod the champions like Boomerange, but he also shod the street horses in Dublin, and his was the last forge in the city. That's an important fact, since Dublin had a city ordinance that required that any horse working on the city streets had to be shod. Thanks to this documentary, John Boyne's voice can still be heard. The interviewer turns away from John at one point and asks questions of his lowly apprentice, Gerry. He's from the north of Ireland, County Tyrone. He represents "the future" of farriery, obviously. As I listened, something in my head clicked. I knew that voice. 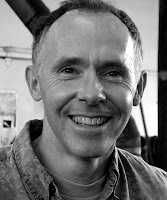 It was Gerard Laverty, who has often been on this blog. He left Ireland and emigrated to Canada. 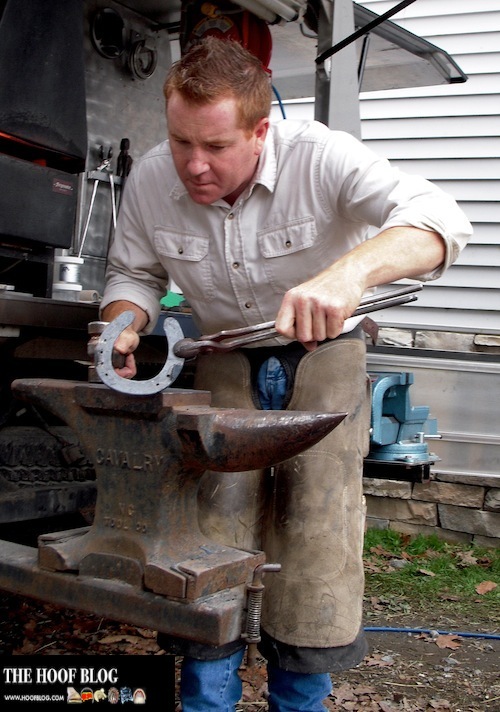 What he learned in John Boyne's forge in Dublin has served him well; he is known head of the farrier school at Kwantlen University in British Columbia and has risen to be an Associate of the Worshipful Company of Farriers. "I was back in Dublin, 1977. A first-year apprentice in the shop on Pearce Street, which still is in operation with his son John Jr. I even have a small part on the show. "John was my boss for three years. He was quite a character. Looked like he’d rob you blind but had a heart of gold. Loved his family, what he did, and the connection to the past.
" He was happiest when he could help to promote an apprentice or give credit to someone just starting their business. He had a wonderful sense of humor and it goes without saying he loved to tell stories. He was an astute businessman and seemed to juggle the work of running a multi-farrier shop with several young apprentices with little fuss. "He was a consummate horseman with a great understanding of lameness and disease. 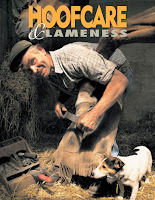 Yet he balanced that with a commonsense approach to shoeing. "John was part of a generation of farriers that is fast disappearing. When he trained in the family shop, he was the 'floorman', one of a two-man team, the other being the 'fireman'. "I remember him telling me when he started his business he'd go to his clients by city bus. As soon as possible, he hired a fireman and built his business from that meager start. "While I was with John he mentioned Seamus Brady and how Seamus had come back to visit while he was in Dublin with the U.S.Equestrian Team (for the Royal Dublin Show). Other than that he laid no claim to giving Seamus his solid start. "I guess that is John at his best, always content to stand in the shadow and celebrate success for us all. "John Furlong was a skilled blacksmith who lived just south of Dublin, in Bray. Every time I met him, I wanted to go spend time in the shop with him. Never did. "I’ve forgotten the name of the other smith from the west of Ireland who made the display of corrective shoes. I think he is the fellow I was originally supposed to train with. He suffered a heart attack so instead I came to Dublin to work in the shop with John. "John McLauglin is still shoeing in Dublin and his younger brother, I've forgotten his name. I think it was Kevin, has worked for some of the biggest names in the Thoroughbred industry (including Coolmore). "Hearing 'Boyner', as we all called him, transported me across a continent, an ocean and thirty-five years. Bonnie, my wife, wise woman that she is, says that, after smell, sound is the best sense to recall memories. "I sure felt that this morning. Sometimes to take a trip you really don’t need to leave home." I'm sure many of the people who listen to this documentary have never been to Ireland. But maybe now their ears have. Visit for the RTE page about this documentary. Home page for RTE's archive of documentaries on all subjects. Today the American Veterinary Medical Association (AVMA) and the American Association of Equine Practitioners (AAEP) issued a joint statement of support for the "Amendments to the Horse Protection Act", as outlined in H.R. 6388 currently in review in the US House of Representatives. A press release issued on November 20 combined statements from the AVMA and AAEP. 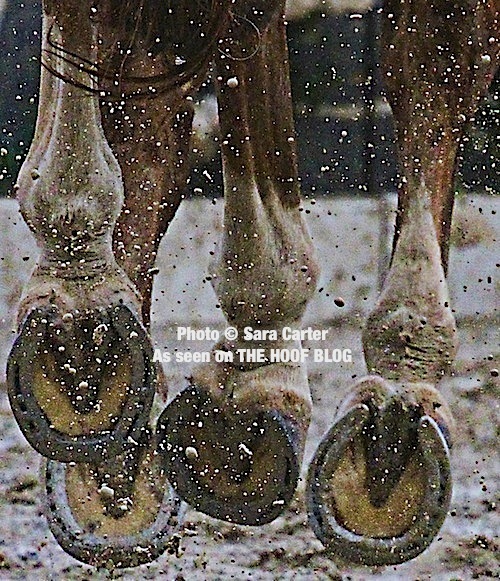 “Soring is an unconscionable abuse of horses that is used to produce a high-stepping gait—the “Big Lick”—and gain an unfair competitive advantage in the show ring," said Dr. Doug Aspros, AVMA President. For decades we’ve watched irresponsible individuals become more creative about finding ways to sore horses and circumvent the inspection process, and have lost faith in an industry that seems unwilling and/or unable to police itself. "The AVMA and AAEP are committed to strengthening the USDA’s ability to enforce the Horse Protection Act and ending this abuse for good. We strongly encourage everyone who cares about the welfare of horses to contact their member of Congress and urge them to pass H.R. 6388,” . Allows for permanent disqualification from the show ring after three or more violations. "The passage of H.R. 6388 will strengthen the Horse Protection Act and significantly increase the effort to end the abuse of the Tennessee Walking Horse," said AAEP President Dr. John Mitchell. "The AAEP encourages all veterinarians to contact their legislators to voice support for the bill and help end the cruel soring of these beautiful animals." For more information on the AVMA and AAEP’s efforts to stop this egregious abuse of horses, visit our Soring Resource Page. Materials include a video, factsheet, backgrounder, reporting procedures, AAEP’s white paper, and the AVMA’s and AAEP’s official position on the issue. The amendment bill was introduced to Congress on September 13, 2012. 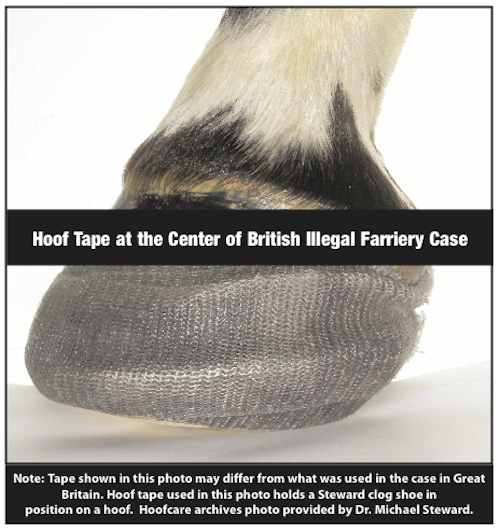 Read The Hoof Blog's coverage of the press conference to stiffen enforcement of the Horse Protection Act by banning action devices and padded shoes. The University of Pennsylvania’s School of Veterinary Medicine (Penn Vet) is pleased to announce that following an international search for a uniquely qualified candidate, Kurt D. Hankenson, DVM, MS, PhD has been appointed as the first incumbent of the Dean W. Richardson Professorship in Equine Disease Research. The Dean W. Richardson Professorship was established by Mr. and Mrs. M. Roy Jackson, following the hospitalization of their Kentucky Derby winner, Barbaro, at Penn Vet’s New Bolton Center. Their desire to contribute to the treatment and elimination of laminitis was the catalyst for their gift to endow the professorship. 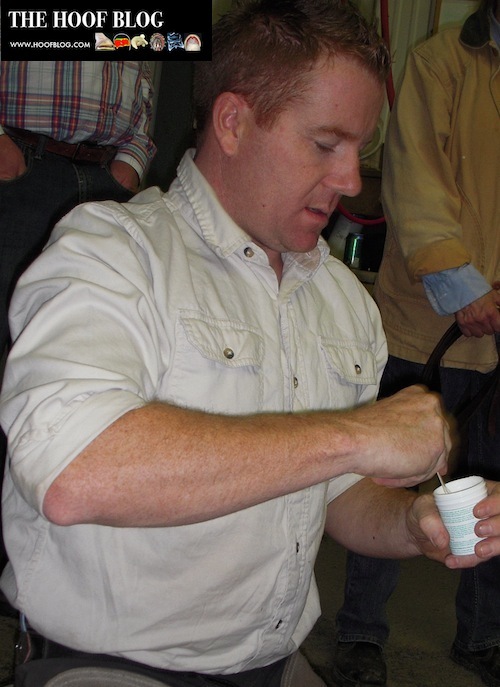 Dr. Hankenson did his undergraduate work at the University of Illinois, where he earned his BS in 1990, and then he earned his veterinary degree at University of Illinois’ College of Veterinary Medicine in 1992. Following his time as an equine clinician, he returned to academia and completed a Master of Science degree at Purdue University’s School of Veterinary Medicine in 1997. He received a Ph.D. from the Department of Biochemistry at the University of Washington’s School of Medicine in 2001. 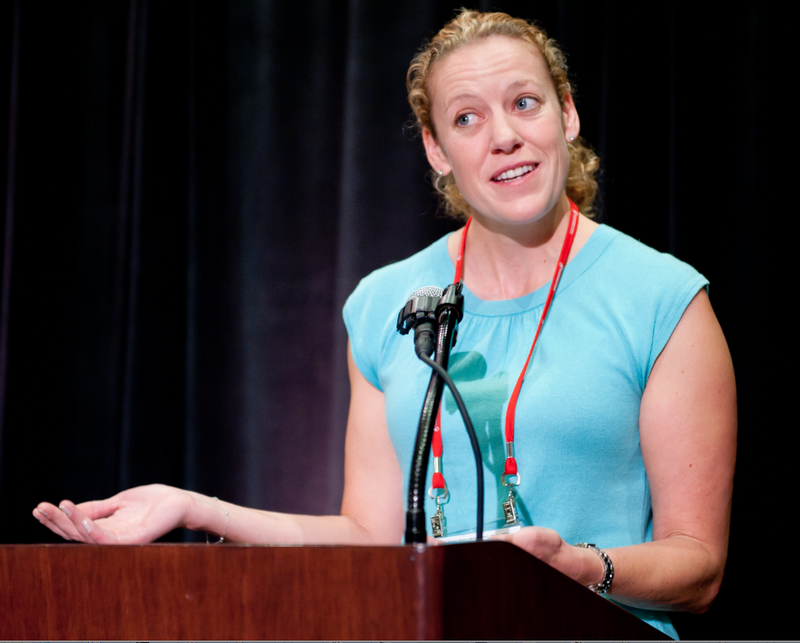 Dr. Hankenson’s career has included an impressive range of clinical and academic positions at both human and veterinary healthcare institutions, and currently holds a faculty position at Penn Vet and at Penn’s Perelman School of Medicine. “I’d like to thank Mr. and Mrs. Jackson for supporting the research mission of Penn Vet by providing this Professorship. I am thrilled to be entering a new phase of my research and teaching career at New Bolton Center, and to be expanding my research program to focus on equine musculoskeletal diseases, particularly laminitis,” said Dr. Hankenson. Joan C. Hendricks, VMD, PhD, the Gilbert S. Kahn Dean of Veterinary Medicine, said that she is especially pleased at Dr. Hankenson’s appointment. The goal of the Dean W. Richardson Professorship is the development of a world-leading research program directly applicable to equine diseases, with particular emphasis on improving the understanding, prevention, and treatment of equine laminitis. A debilitating, painful, and uncompromising condition, laminitis is the second leading killer of horses worldwide and is presently uncurable. Winner of the 2006 Kentucky Derby and a beloved American icon, Barbaro suffered a catastrophic fracture during the running of the Preakness that year. After undergoing successful surgery at New Bolton Center, he developed severe laminitis, which eventually led to his death. This Professorship serves as a lasting legacy of Barbaro. Four horses suffering from laminitis have been treated with the investigational anti-inflammatory drug so far. One experienced a complete remission that has lasted for more than a year, and three others have shown some improvement. A paper on the first laminitis case has been accepted for publication by the peer-reviewed Journal of Veterinary Anaesthesia and Analgesia. The paper is expected to be published in the journal’s February issue, but journal editors authorized the authors to disclose their findings ahead of publication. The horses were treated under a “compassionate use” protocol approved by the UC Davis Institutional Animal Care and Use Committee. That protocol allows animals to be treated with an experimental drug if no approved alternative treatment exists. A clinical trial to assess the drug’s safety and establish a tolerable dose for the compound is expected to begin in the spring. Further clinical trials would be needed to establish the drug’s effectiveness as a laminitis treatment. The experimental compound, known as t-TUCB, belongs to a group of anti-inflammatory compounds called sEH (soluble epoxide hydrolases) inhibitors. It stems from a discovery made more than 40 years ago by UC Davis entomology professor Bruce Hammock while doing basic insect biology research. Originally interested in finding biological insect control methods, Hammock has since broadened his research to also search for biomedical applications. He and colleagues have identified a group of anti-inflammatory compounds, including the sEH inhibitors, that have proven to be effective in relieving inflammatory discomfort and pain related to nervous system disorders in mice and rats. Their work has been published in scientific journals including the Proceedings of the National Academy of Sciences and the Journal of Medicinal Chemistry. 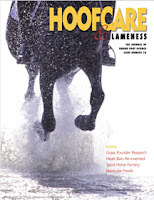 Guedes noted that the safe management of laminitis-related pain is one of the biggest challenges for equine veterinarians. Often, euthanasia is the only humane alternative for alleviating pain and suffering in horses afflicted with the condition. Consequently, according to UC Davis, the survival rate for laminitis is estimated to be only 25 percent. Very few surviving horses return to their previous levels of activity, and laminitis often reappears. 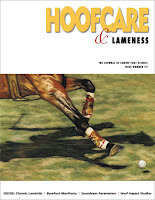 In his upcoming paper, Guedes reports the case of a four-year old Thoroughbred mare named Hulahalla. The horse had been retired from racing following a tendon injury and donated to the UC Davis School of Veterinary Medicine, where it was participating in a study focused on healing tendon injuries using stem cell treatments. She developed laminitis. 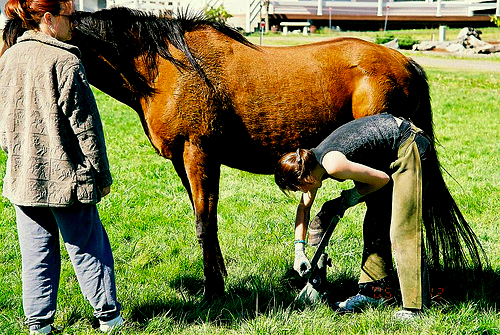 Veterinarians from UC Davis’ William R. Pritchard Veterinary Medical Teaching Hospital treated the laminitis with conventional therapies including cold immersion, antibiotics, leg wraps, and two commonly-used nonsteroidal drugs intended to reduce inflammation and relieve pain — but the horse only got worse. At the point that the mare was spending most of the day lying down, Guedes got involved. Before resorting to euthanasia, Guedes and the veterinary team decided to try one last treatment, t-TUCB. The veterinarians administered the experimental compound intravenously early on the eighth day of Hulahalla’s illness. After receiving the first dose, the horse remained standing in the stall most of the day, became interested in her surroundings and walked voluntarily. The mare’s demeanor, posture and mobility continued to improve over four days of treatment, and her high blood pressure gradually returned to normal. No adverse affects from t-TUCB were observed, and Hulahalla has remained laminitis-free for a full year. The sEH inhibitors, including t-TUCB, are currently available from the Hammock lab, which has provided the experimental compounds to more than 100 academic scientists around the world for basic investigation into their role in treating disease. Hammock said that work aimed at moving t-TUCB and related compounds toward clinical use is advancing in several areas. He and Guedes are working on compounds with potential for targeting pain and arthritis in companion animals. And they are working with UC Davis to move the intellectual property from this research into a company to develop medications for difficult-to-manage neuropathic pain associated with diabetes and nerve injury. The University of California at Davis provided this article. Click to order this award-winning anatomy reference graphic for the wall of your clinic, forge or office. Temporary open access to a group of laminitis research papers is available to students, professionals and horse owners. The Equine Veterinary Journal (EVJ) has announced that it is giving the public open (free) access to a collection of important new research papers on equine laminitis. Normally, non-subscriber access to these articles would be as much as US$40 per view. The papers include practical advice as well as the latest research. The initiative has been made possible thanks to sponsorship from the British Equine Veterinary Association (BEVA) Trust. In addition, the issue contains several articles from international experts commissioned by the EVJ on important aspects of laminitis including causes, treatment, prevention and future research projects. 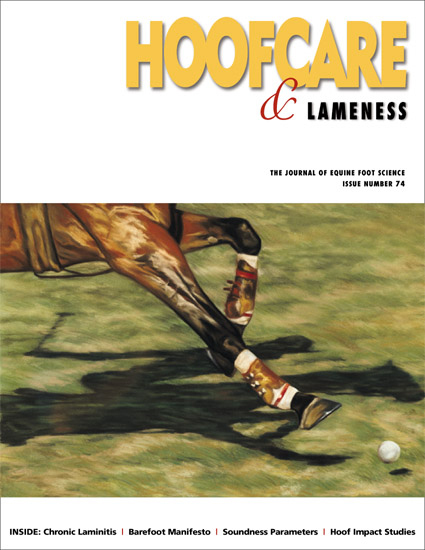 Contributors to this special issue include world-leading equine veterinary and research experts on the subject of laminitis: James Belknap, Ray Geor, Samuel Black, James A. Orsini from the USA, Andrew van Eps from Australia and Nicola Menzies-Gow from the UK. 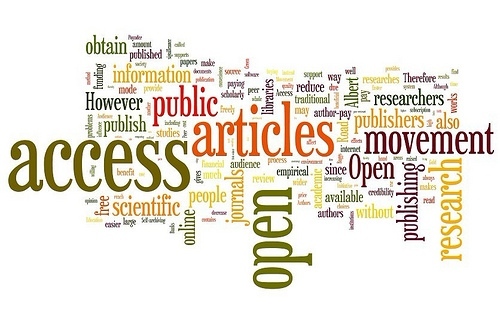 The landscape of academic publishing is changing as "open access" becomes the zeitgeist. Open access in scientific publishing is a growing controversy in the academic and professional publishing world. New peer-reviewed journals are appearing that offer the public free viewing and sometimes downloading of new research and educational content, while others continue to restrict access to individuals and libraries that purchase subscriptions. These new journals both challenge the traditional model of restricting access to research while also expanding exposure for researchers. Logo for the open access system. 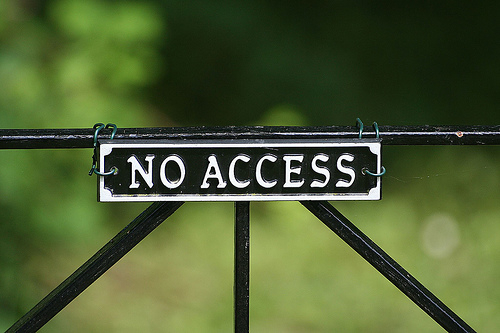 Authors and researchers desire more access for their papers, but the traditional model restricts access, and the fees do not go to the authors and researchers. Journal publishers, on the other hand, have the high cost of editing and printing journals and of maintaining web sites. The debate over open access is a fascinating one. EVJ's opening of this special issue to the public is evidence that the British Equine Veterinary Association recognizes the benefits of at least occasionally opening a few papers to the public, who often donate to the research that is detailed in the papers, but are often asked to pay to read what they have already funded. Click to view ordering information for your own copy of Professor Denoix's valuable reference on the horse's foot. Today we go across the ocean and behind the scenes. The location is Stromsholm, Sweden, home of Professor Lars Roepstorff,.DVM, PhD and his amazing research into how horses move. Whether you want to know how a horse moves or how the surface beneath the horse affects his gait, speed, or traction, this is one of the places in the world that could help you figure it out. 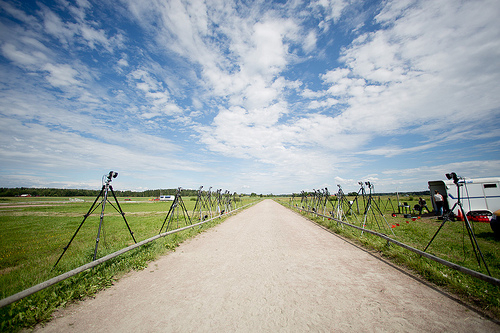 At the recent International Conference on Canine and Equine Locomotion, a field day (literally) was held at Stromsholm to showcase the capabilities of the research facility and of the technical equipment used in the research. Both the horse and the rider are being tracked by the Qualisys cameras. One setup showcased the three-dimensional motion capture ("mocap") capability of 60 Qualisys Oqus cameras. 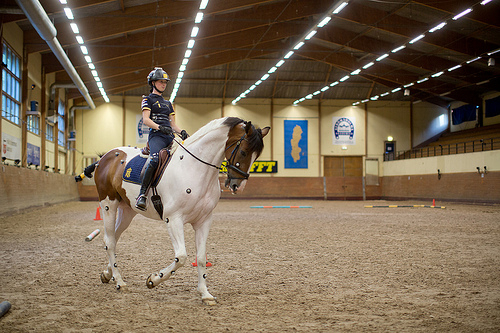 With a motion capture system this big, it was possible to have a capture volume of 20x40 meters--this gave dressage and jumping horses the freedom of being evaluated for a series of strides and movements at full canter. Measurements were made on dressage horses, jumpers, trotters, Icelandic horses (pace & tölt) as well as German and Belgian Shepherds running at full speed--who didn't make it onto this little video. In the outdoor setting, the horses can work naturally and be captured in a series of strides. The camera system was first used indoors, in a 60 camera setup. It was later moved outside into a 42 outdoor-camera system for the Icelandic horse and the trotter. Qualisys is the clever tech firm that developed the software and assists the researchers in ramping up the technology to ever greater accomplishments. Their software is often featured on the Hoof Blog, and we look forward to what's next! 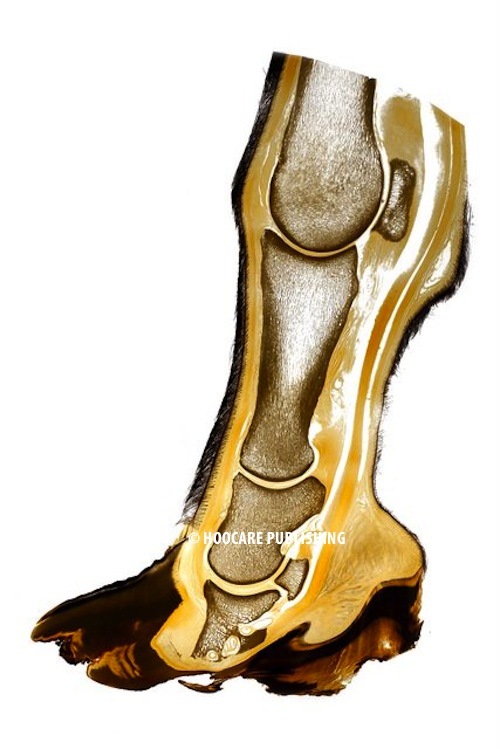 Click on the ad image to go to the info page for the hoof wall anatomy poster. British Equine Laminitis Research Expands: Why Are Some Horses More at Risk? New research will look at blood flow to and within the horse's foot to determine why some horses and ponies are pre-disposed to laminitis. The research will be conducted at the Royal Veterinary College in Great Britain. This plastination casting of the blood supply shows the intricate variety of types of blood vessels that serve the foot. A dead horse's foot was injected with plastination material and the foot was treated to remove all evidence of tissue except the plastination. In this model, the blood vessels of the sole were removed to allow a full view inside the foot. Corrosion casts like this one are sold by Hoofcare Publishing for educational and professional use. 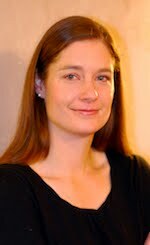 Great Britain's Royal Veterinary College (RVC) and the WALTHAM® research group are pleased to announce that veterinarian Elizabeth Finding, has joined them and the WALTHAM®-led International Laminitis Consortium to start her PhD on laminitis. 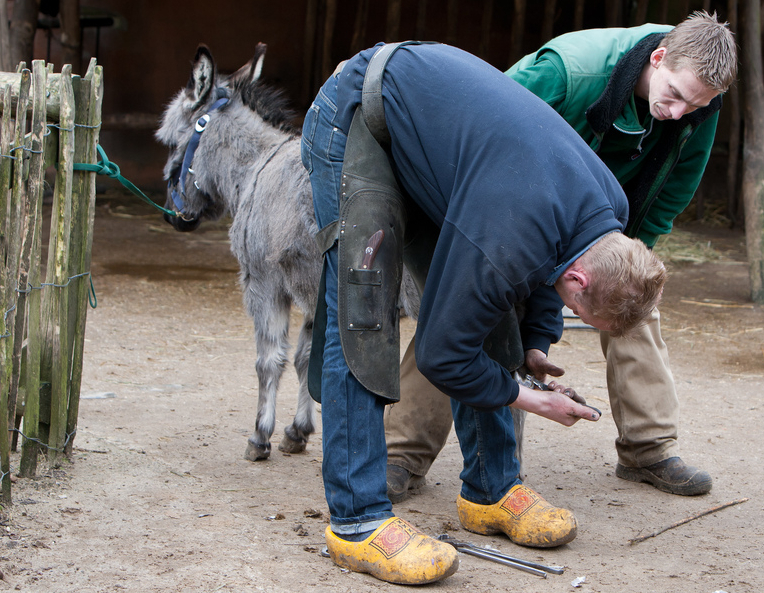 Finding will continue the essential search into why some horses and ponies have an increased risk of laminitis. Laminitis is well-recognised as a major global welfare issue; it is a disease causing pain and suffering in those affected. Understanding why some individuals are prone to develop this painful--and potentially fatal--condition has been one of the major goals of the Laminitis Consortium so that targeted preventative measures can be put in place. Anecdotal information has suggested that there is often an increase in incidence in laminitis following a bout of cold frosty weather. Previous work undertaken at the RVC has suggested that temperature may influence the reactivity of certain blood vessels of the hoof. As part of her four-year PhD project. Finding will develop novel methods of assessing blood flow so that she can analyze changes associated with diet and season. In addition, she will be comparing innovative markers of blood vessel health between those that are and are not prone to laminitis. Finding explains: “We hypothesise that ponies prone to laminitis have a dysfunction of the cells lining the blood vessels ("endothelial cells"). This may make them less effective in generating mediators which normally continuously dilate blood vessels and thus protect against the blood vessel constriction. It is thought that abnormal constriction may be initiated by the ingestion of too much rich grass especially under adverse environmental conditions." The WALTHAM®–initiated International Laminitis Consortium comprises world-leading equine veterinary, nutrition and research experts interested in collaborating on the important topic of laminitis. It includes Dr Nicola Menzies-Gow and Professor Jonathan Elliott of the RVC, Professor Pat Harris of the WALTHAM® Equine Studies Group, and Clare Barfoot of Mars Horsecare UK Ltd.
From Hoofcare and Lameness: Elizabeth Finding is the lead author of a paper published in June 2012 in the American Journal of Veterinary Research (AJVR), "Evaluation of a technique for measurement of flow-mediated vasodilation in healthy ponies". In that study, Finding and her colleagues tested between-pony and within-pony variations and interobserver and intraobserver agreements of an ultrasound technique for measurement of flow-mediated vasodilation (FMD) in healthy ponies. 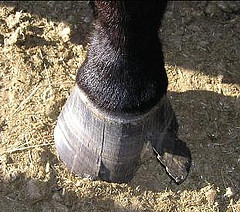 Testing and evaluation were favorable for using this technique in future research related to laminitis. Finding is also the author of "Flow-Mediated Vasodilation in Healthy Ponies", published in the Journal of Veterinary Internal Medicine.